Engadget.com recently reported that Amazon will soon roll out a "Kindle Development Kit" that will allow folks to create "active content" for the popular e-reader. Although Amazon doesn't specify in its announcement what "active content" means, it more than likely means games. 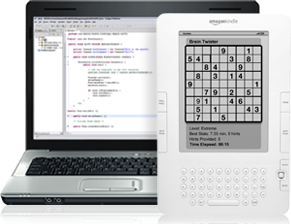 Heck, the image accompanying the announcement (below) shows a Sudoku-sporting Kindle. It would be great if a few text adventures--or even graphic adventures--appear alongside all of the Brain Age-esque, solitaire and Sodoku games that are sure to swarm the Kindle Store when the service launches later this year. Can't ANYTHING just be what it is?! The Kindle is a READING device. The Playstation is a GAMING machine. PIZZA HUT IS NOT A PASTA RESTAURANT! I don't understand this awful fascination with everything being everything else all of a sudden. We need a move towards purity in device functions. I'm glad SOMEONE does! Everyone else thinks I'm crazy. "Why shouldn't the PS3 play movies and access the internet? WHy shouldn't Pizza Hut serve pasta?" they ask. Bah!